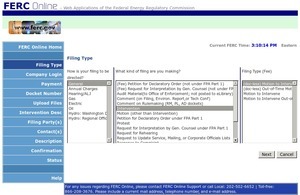 From FERC’s front page, ferc.gov, hover your mouse over DOCUMENTS & FILINGS and click on eFiling, which will take you to this link: http://www.ferc.gov/docs-filing/efiling.asp. Use eRegister if you don’t already have a login. 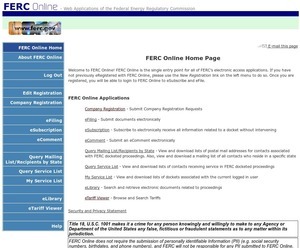 Once you are registered, log in. Under “How is your filing to be directed?” select General. Under “What kind of filing are you making?” select Intervention. Remember you can file more intervention documents later; you don’t have to file anything but the bare information now. Enter CP15-17 in the text box and click Search. 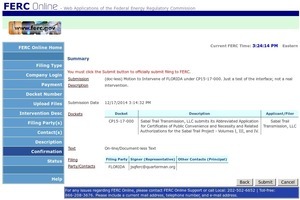 Click the plus mark (+) next to Sabal Trail Transmission, LLC. Once you’ve added dockets, click Next. If under “Filing Type” you selected “(doc-less) Motion to Intervene” here’s what you need to do at the current step. Type in a paragraph describing why you want to intervene. If fossil fuel companies can do it, pipeline opponents can do it. 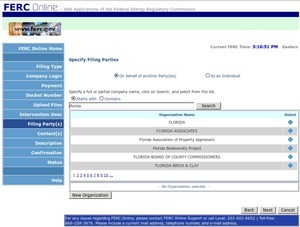 Once you have entered your description, click Next to go to “Specify Filing Parties“. 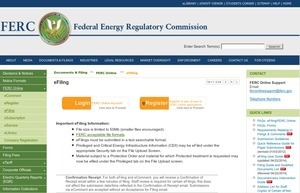 If under “Filing Type” you selected “Motion to Intervene” you also get an opportunity at this point to upload documents. Here is an example, from Gulf Restoration Network. 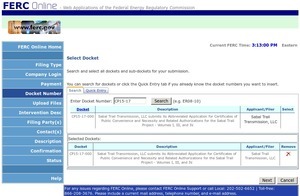 Once you have uploaded all the documents you want to include, click Next to go to “Specify Filing Parties“. If you want to intervene on behalf of an organization, enter a piece of its name in the text box and click Search. 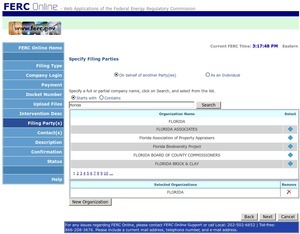 If you can’t find your organization by searching, click on New Organization to add it. 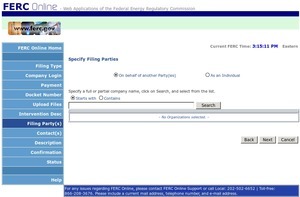 Once you have found your organization, click Next. Specify the person or persons to whom communication should be addressed. For service list-related filings, all persons to be added to the service list must be eRegistered and added as a signer or other contact. Type an email contact address into the contact box, and click Add as Signer. If you want more contacts, type them into the box one by one, and click Add as Other Contact after each one. 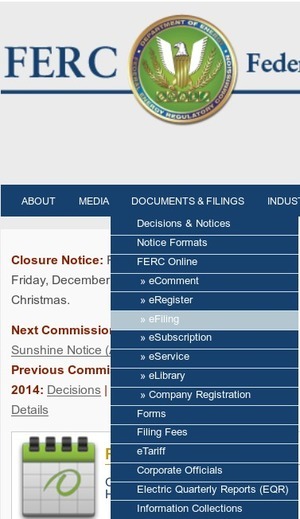 All such addresses must already be eRegistered, or you’ll get the error message you see here. Once you have your contacts entered, click Next. 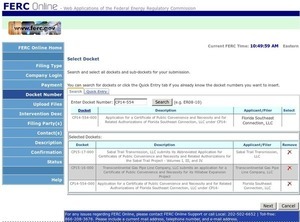 Modify the submission description in the text box as desired. Review the information. If you want to change it, click Back and modify what needs changing. Once you’re satisfied, click Submit. You should see a screen saying your submission has been seen, and an email message, as well. Your submission should show up the next working day in FERC’s elibrary. Go ahead and subscribe to the docket with eSubscription and you’ll get an email notice when that happens.